We're All Going to Hampden! A last gasp goal from Marc Fitzpatrick sent thousands of Motherwell fans celebrating down Easter Road on the way to the CIS Cup final at Hampden. What a night! What a wonderful way to win a semi. The guys did it the hard way but they deserve lots of credit for having the courage to recover from the body blow of losing a two goal lead going into the last ten minutes of normal time. The manager altered both the starting eleven and the tactics.Leitch and O'Donnell were restored to central midfield supported by McBride and Paterson.Foran spent much of the game in midfield leaving McDonald as a lone striker for long spells.The back four were the familiar Hammell, Craigan, Partridge and Corrigan. 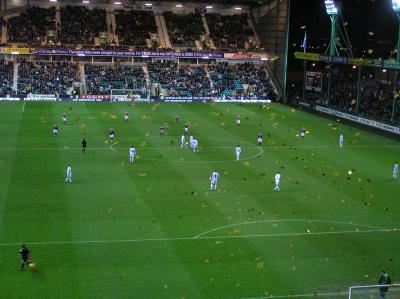 The opening exchanges saw much effort but little in the way of football and it was Hearts who had most of the possession. We had a spell of pressure after fifteen minutes which started when Foran was fouled on the left touchline.He was on the end of the resulting free kick and headed back across the goalmouth for our first chance of the game.Moments later we had another free kick, this time from the right wing and Craigan headed home. Again Hearts pinned us back for worrying spells but we held firm.Leitch had an attempt from thirty yards well held and just before the break Foran popped up to clear from our goal line. The second half was less that twenty seconds old when a defensive deflection saved us from the equalising goal.The Tarts were making their attacking intentions clear and they redoubled their efforts when Robbo made a double substitution. Marshall was kept busy and with twenty minutes left he was at his best to reach a low shot to his right hand corner.Minutes later we thought the game safe when McDonald wasfelled in the box.Foran made the most of his converted penalty. Clarkson and Fitzpatrick provided fresh legs to replace Paterson and McBride and the clock ticked on.Both teams fought hard in every challenge and the eighty minute mark was passed. Then the roof fell in. Five minutes to go and it seemed that Hearts had the consolation goal that their efforts deserved but worse was to follow. Clarkson scuffed a marvelous chance over the bar from eight yards after the tireless McDonald had delivered it on a plate.A couple of the fourth official's four added minutes had passed when the scores were levelled at two all. The Edinburgh support found its voice while we tried to gather ourselves to lift the boys in extra time. The 'Well support feared the worse as both teams tired. 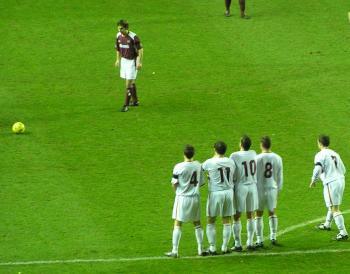 Quinn replaced Foran as the dreaded prospect of penalties drew nearer.As we reached the end of the 120th minute a Hearts' attack broke down and Clarkson, from the centre circle released young Fitzpatrick down the left.He raced into the box and aimed his attempt across the keeper towards the far corner.The roar as the ball found the net would have been heard on Princes Street. Hearts kicked off and the ref blew for the last time.Cue thecelebrations. As the beaten Jambos scuttled away Terry Butcher lead the post match euphoria as he organised the players' salute to the fans. Regardless of the outcome in the final, the achievement of the team tonight has ensured that they dererve a place in future 'Well histories.Well done.